Joint talks between the African Population and Health Research Center (APHRC) and the International Centre for Insect Physiology and Ecology (ICIPE) were held on 15th September 2010 at the APHRC offices. 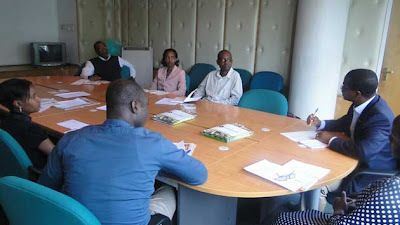 The meeting is a follow-up on discussions initiated on 13th August 2010 by the two institutions on ways to collaborate on issues of research capacity strengthening in Africa. The purpose of the meeting was to map out specific areas of collaboration in building sustainable capacity among researchers in Africa, who needed to be provided with an enabling environment, exposure and opportunities to make them competitive. Both institutions agreed to seek opportunities to develop joint proposals to support research capacity strengthening efforts and share both human and physical resources. Particularly, it was noted, the established accommodation and laboratory facilities at ICIPE could greatly benefit APHRC's capacity strengthening initiatives such as the Consortium for Advanced Research Training in Africa (CARTA) and the African Doctoral Dissertation Research Fellowship (ADDRF). Participants agreed on the following areas of cooperation: Supervision by established scientists; sharing infrastructure and other resources, including laboratories and hostels; exchange of staff and postgraduate students; and joint research training workshops, among others. A memorandum of understanding to govern the collaboration as set out during the discussions has been signed. The meeting was attended by the APHRC Executive Director, Dr. Alex Ezeh, Chimaraoke Izugbara, Caroline Kabiru, Beatrice Arionget and Makau Ngola of APHRC. ICIPE was represented by Dr. Daniel Masiga, Baldwyn Torto, Lilian Igweta and Anne Njui.